My Wacom pen can do a triple back flip on beam. Can yours? Over the years my Wacom has endured some all terrain handling, and recently the rubber grip area fell off in protest. 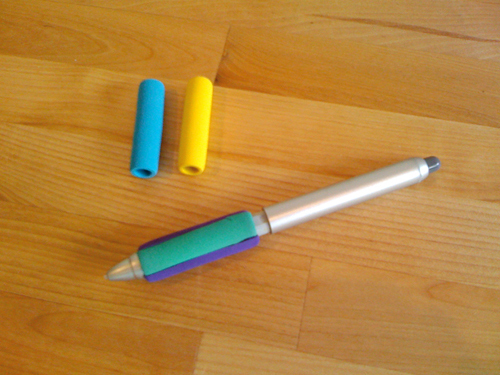 So I bought a pack of those foam pencil sleeves and upgraded my pen to Delux Wacom Pen Gripper Status. Only 1 and 1/3 pencil sleeves were needed to make this baby look like it was sponsored by a gymnastics team. My landlord said I should blog about this.